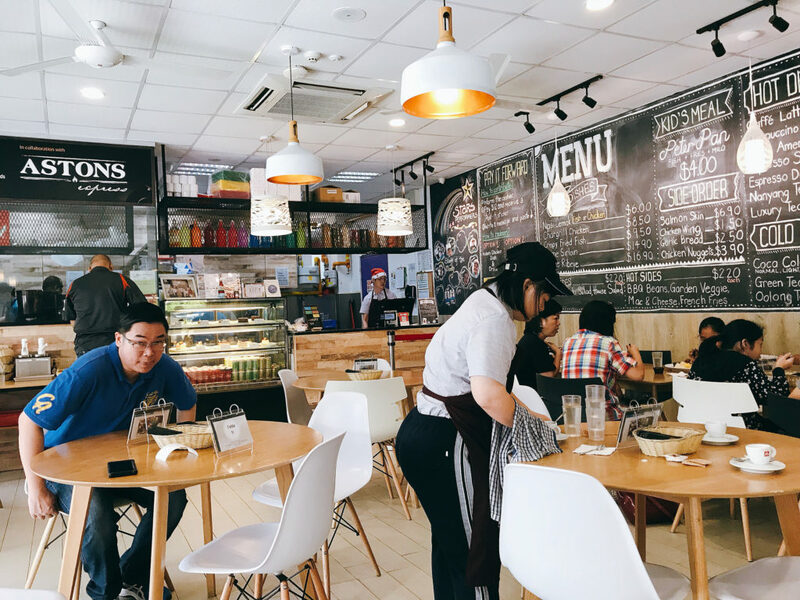 Tucked away in a corner of Chai Chee Community Hub at Kembangan, the little cafe dishes out not only Aston’s signature dishes, but also delicious Western-fusion dishes, cakes, and tarts at seriously modest prices. Spearheaded by an experienced trainer in the kitchen, there are five to ten trainees in the kitchen everyday, working hard to whip up nod-worthy dishes. 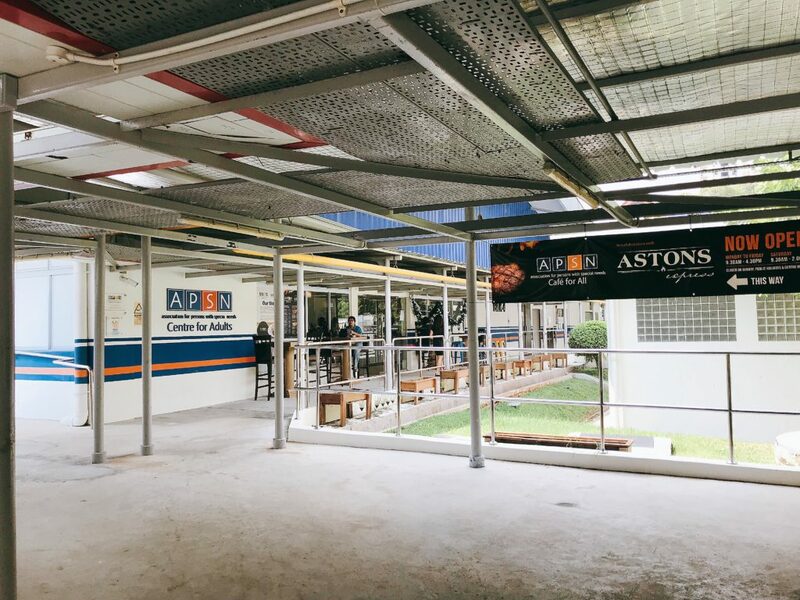 In actual fact, the APSN Cafe goes beyond the happenings in the kitchen. 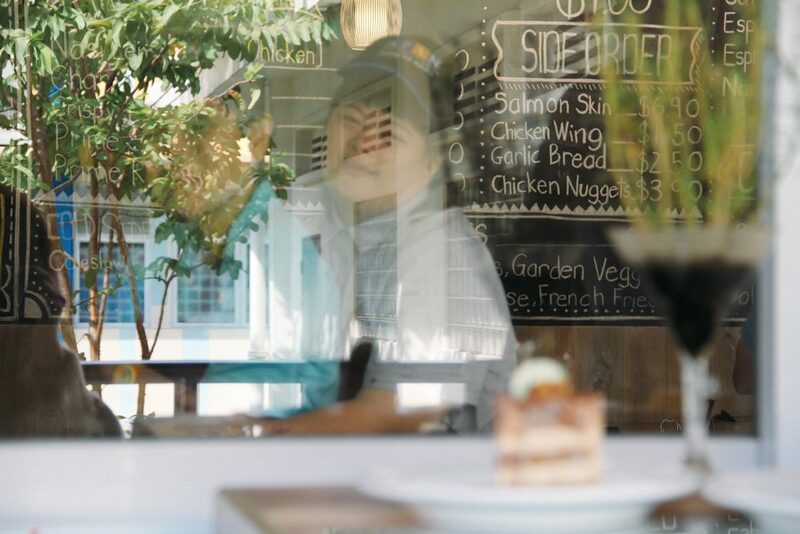 We had a peek at what goes behind on the façade of the small, cozy cafe and were welcomed to a series of ‘classrooms’ where the trainees progress with their daily duties. In this centre, they are taught basic hygiene and skills like cooking, baking, and even planting. In a vertical greenhouse hidden behind the cafe, we were surrounded by lush greenery and lively plant pots, where the trainees grow herbs and spices which will be brought fresh to the tables in the cafe. 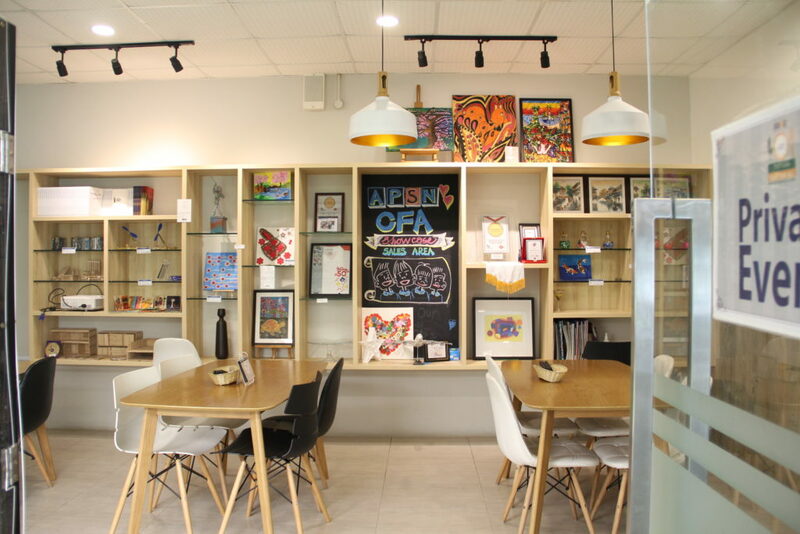 Every nook and cranny of the APSN centre brims with a positivity that showers you with warmth right as you set foot in the cafe. After being greeted by an earnest trainee and a well-lit interior, you will see a long stretch of chalkboard across the length of the wall with a neatly handwritten menu. As you explore the quoins and corners, expect to see artwork and masterpieces that are also crafted by the trainees. Feel free to dine al fresco if you’re on a date. We went on a random Tuesday morning and the cafe was surprisingly teeming with life. There were many customers and volunteers from around the area. 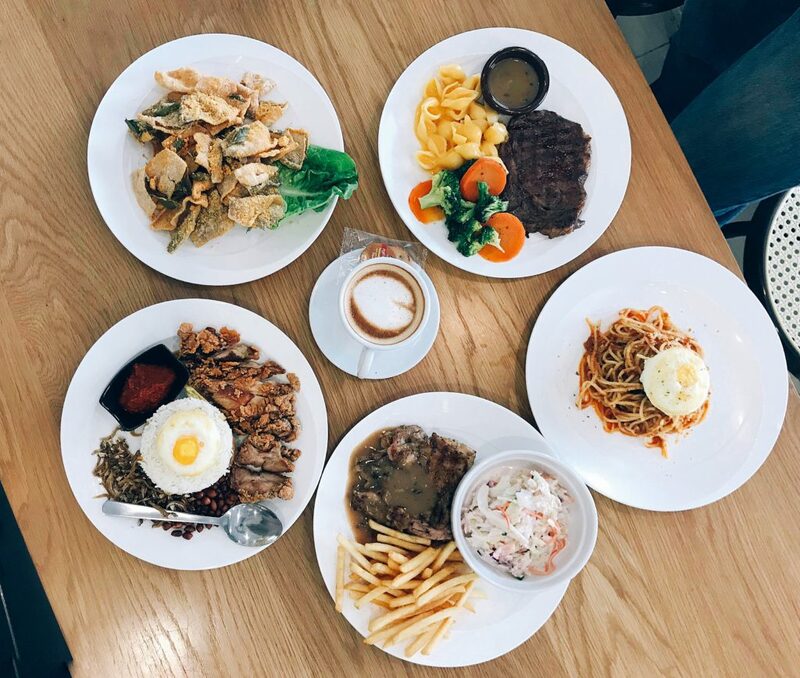 With a compact menu that offers only the best staple signatures, we were truly wowed by the quality of the food, especially at such humble prices. 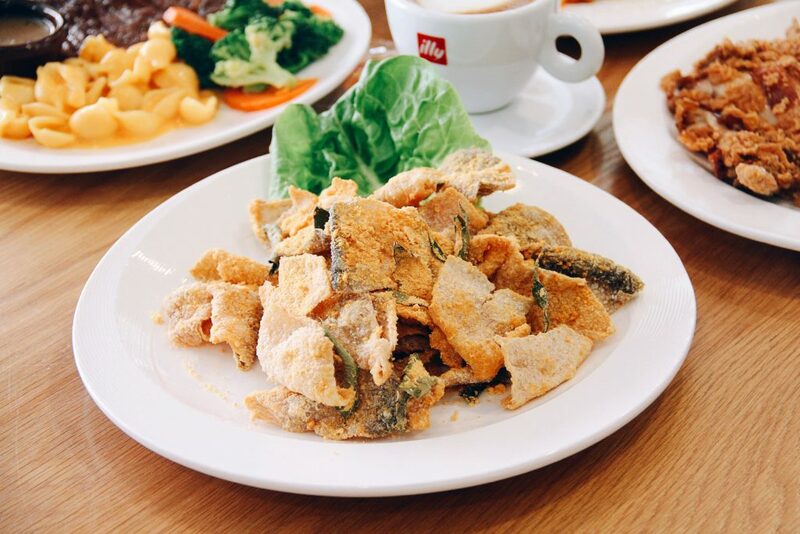 As a lifelong member of the everything-also-can-salted-egg club, this plate of golden salted-egg flavoured Salmon Skin ($6.90) screams out my name as it is placed before our eyes. 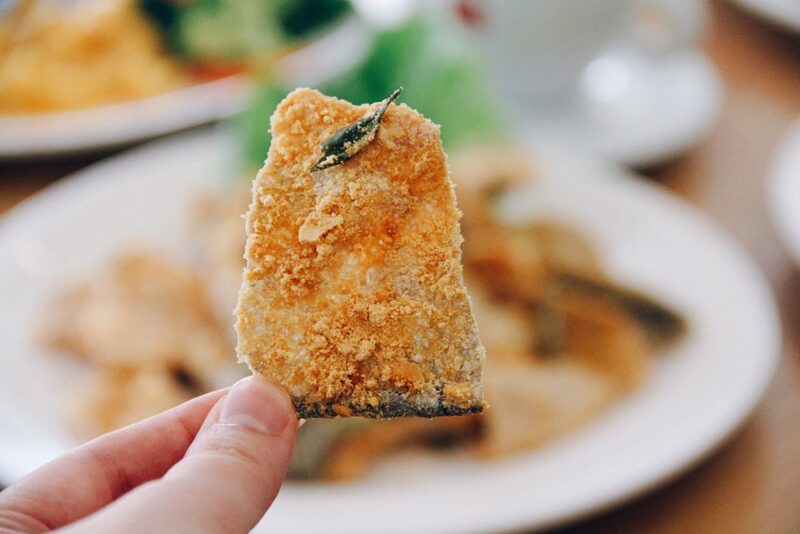 Dusted generously with their house-made recipe of salted egg seasoning, each salmon skin chip is light and crispy – the way that it should be. While I like my salted egg dishes to bring me a hint of sweetness, this leaned toward the salty side, but still kept my fingers busy grabbing for more. It didn’t take long for this pentagon of mouth-watering dishes to be set on our table, and we were sent into a frenzy of picture-snapping. The cheapest of the five dishes, yet the unanimous favourite on the table. The Nasi Lemak ($6) here is pretty standard: you get coconut rice, ikan bilis and peanuts, a dollop of house-made chilli, and a choice of fried fish or chicken. The coconut rice was a little dry and it wasn’t as lemak as I’d like, but damn, the chicken really spoke to me. Armoured in a crispy batter that is both light and well-seasoned, the chicken cutlet had a tenderness that I did not expect. Unfortunately, we didn’t get to taste the fish. The chilli packs sweet, tang, and spice all into a tiny dollop, and really shines in contrast against the rice. 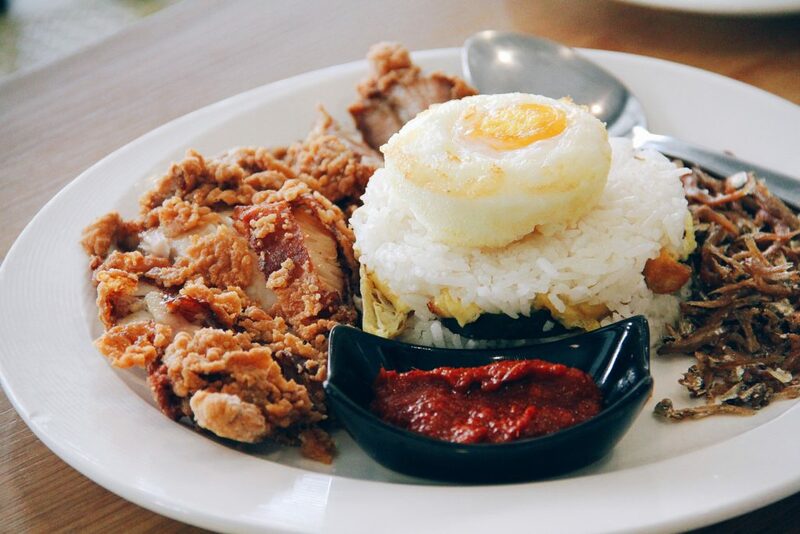 It’s a little different from the nasi lemak sambal chilli you’ll find outside, but this is still a delicious recipe unique to APSN Cafe. Cutting the egg open, I involuntarily let out a happy squeal. 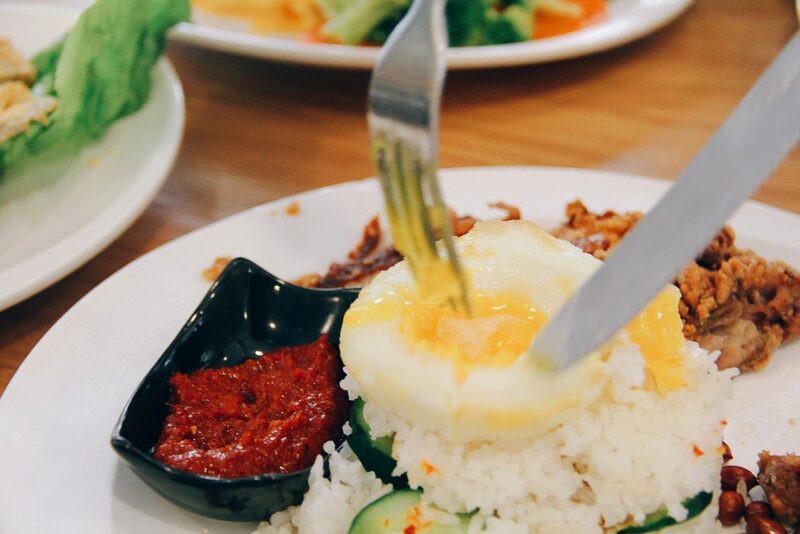 It was fried to an over medium, where the yolk is cooked but still slightly runny – the perfect doneness of egg to have over rice. Next, we dug right into the Aston’s classic, the Chargrill Chicken ($8.50). 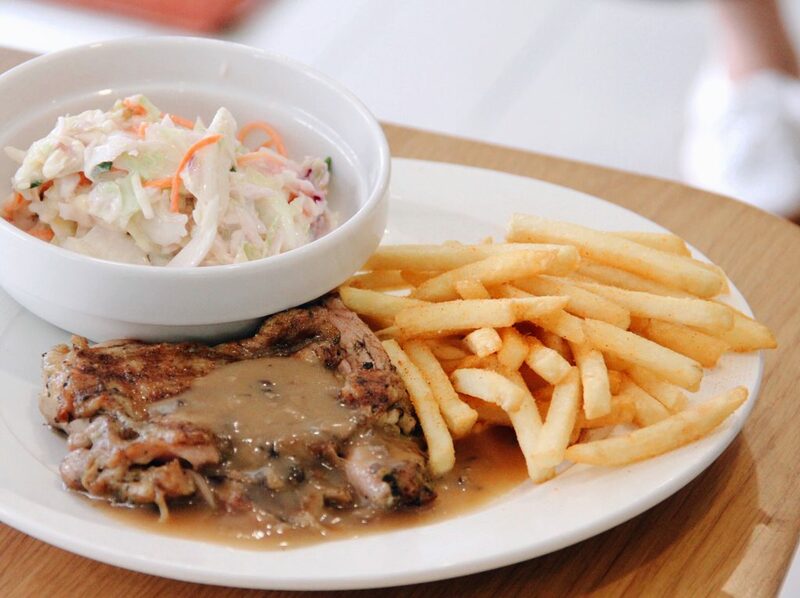 Right off the bat, it looks exactly like what you’ll find at any Aston’s outlet – a proper char on the outside, lashed with some mushroom sauce, and a side of crispy fries and coleslaw. Slicing into the brown chunk of chicken and taking a hearty bite, we were not at all surprised that the quality is neck and neck with its role model at other Aston’s outlets. It was succulent and juicy to the bite, although I could do with a little less fat from the chicken. Fries stayed crispy for a substantial amount of time and was flavoured sufficiently with a little paprika. 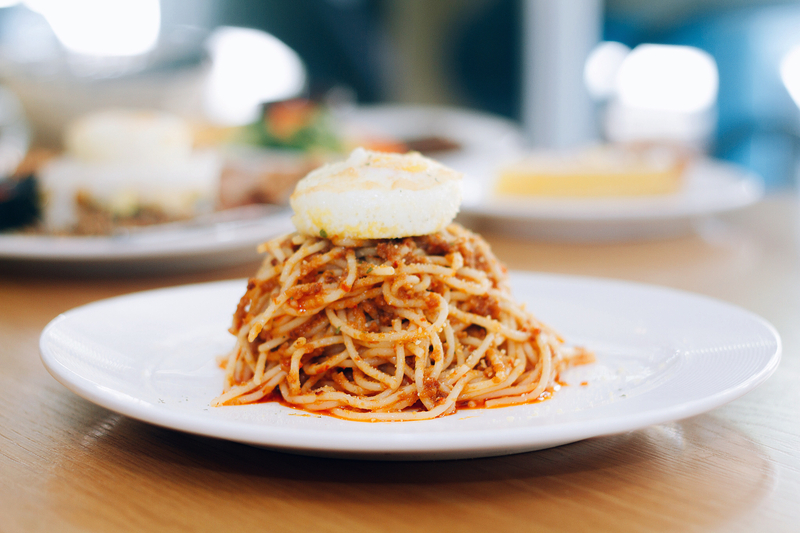 Holding the marriage of East and West on a clean white plate, the Hae Bee Hiam Pasta ($8.50) is an original creation by APSN which will be fresh on the menu from 3 December onwards. As I locked my eyes on the tangle of pasta noodles, I realised every strand was coated evenly with the sauce and everything was plated with finesse. Sure enough, the pasta was deeply flavourful, perfumed perfectly with a sweet shrimpy flavour. While the thick sauce did a swell job at delivering stellar flavours, pairing it with the fully drained pasta created a rather starchy partnership. The overall texture had room for improvement, but this definitely deserves attention for its moreish sweet and savoury flavours. 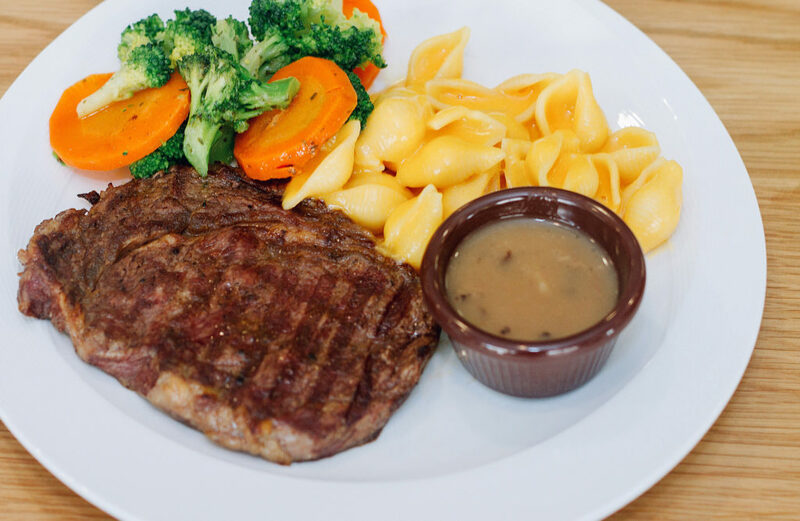 A trusty go-to for the meat lovers, the Prime Ribeye ($16.90) gives you a sturdy slab of steak with two sides of your choice. The doneness of the meat was well-grasped by the trainees, which revealed a slight pink hue when we cut through it. As you take a moment to digest the food photos, meet Angie (the one on the right), the designated floater during our visit! Between her brilliant smiles and a playful character, she keeps a constant eye on the floor, making sure that she has done her job properly. As she delivers dishes to our table, she keeps in mind to say “enjoy”, or even “happy birthday” when she serves us our cakes, which tickled my funny bone a little. Anyhoo, having her around really helped to spread loads of positive vibes around the cosy little cafe. 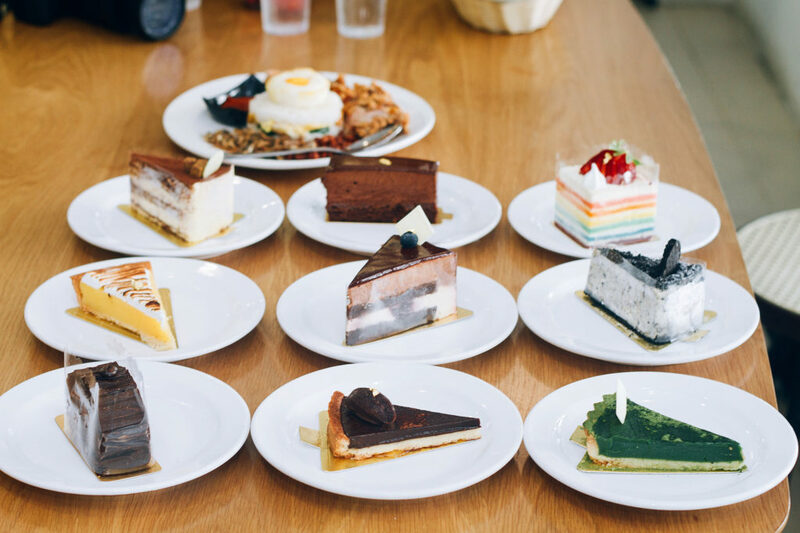 No, we did not eat all these cakes, but here is a look at the spread of desserts you can find here to sweeten up your palate. 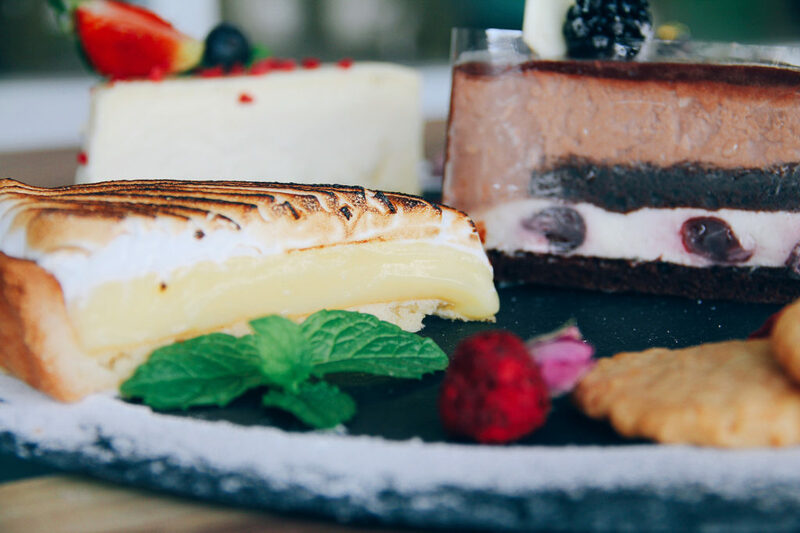 Ranging from only $5 to only $7, perk yourself up with one of their zesty Lemon Meringue Tarts, or even a decadent Chocolate Mousse Cake if you please. These preppy little cakes are all made by the trainees in-house and are super inexpensive. 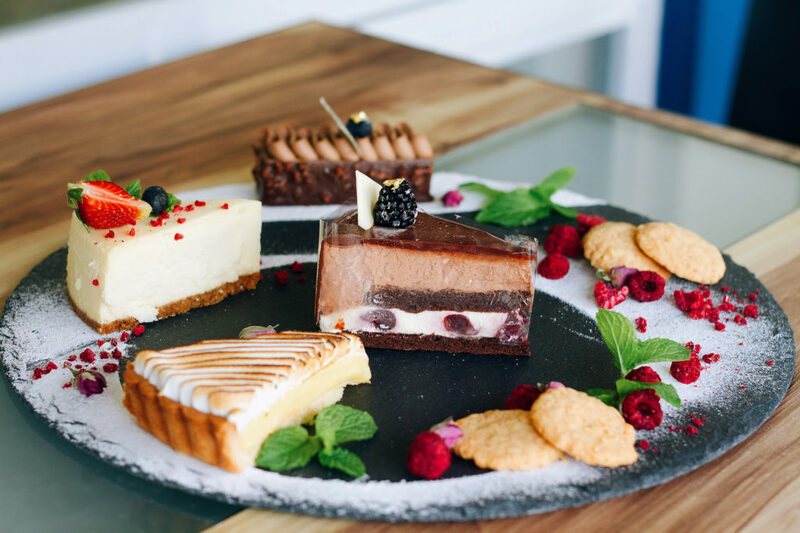 We managed to taste four popular flavours here – Lemon Meringue Tart ($5.50), Blackforest Cake ($7), New York Cheesecake ($5.50), and Hazelnut Ecstasy Cake ($7) – plus a side of their handcrafted Royale Cookies. The mint leaves you see here are plucked fresh from their garden! I had a hard time deciding which one was my favourite, it’s like asking me to choose my favourite child. Ultimately, the one that really stood out for me on this platter of babies is the Lemon Meringue Tart while my colleague sang praises for the Blackforest Cake. Baked beautifully to reveal stripes of golden brown, the meringue was airy and subtle, which was a perfect match to the dense lemon custard. The bright yellow layer was not shy at all with its refreshing zestiness and played around harmoniously with the soft pie crust and fluffy meringue. I would have, however, preferred the crust to be more crumbly. The Blackforest Cake was eager to shine as well, showcasing a complementary variety of layers – milk chocolate ganache, light chocolate whipped cream, dense chocolate sponge, and whipped cream with cherries. Take a bite of it and let the layers melt in your mouth, leaving a juicy cherry to cut through the creaminess. Like the atmosphere around here? 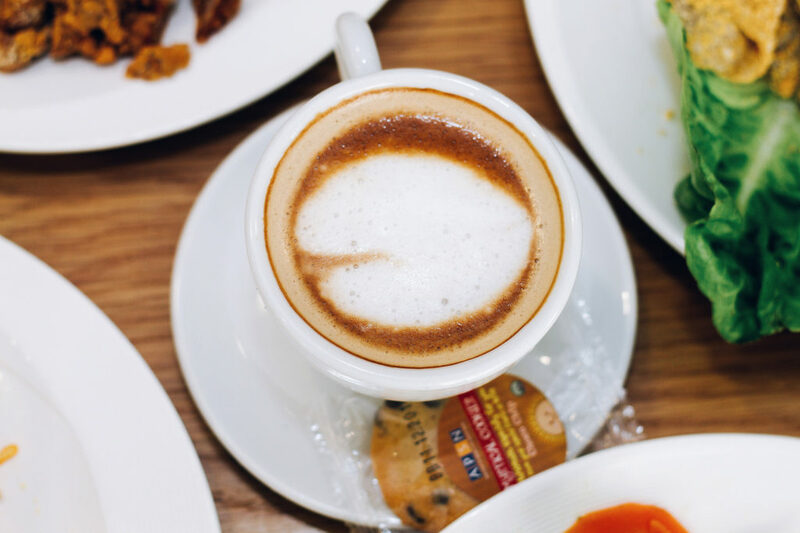 Stay for a cup of Caffe Latte ($3.50) with a sincerely handcrafted latte art. Our cuppa was made by Siti, one of the trainees here. She very proudly showed me her phone gallery of various latte arts she has crafted. It seems that she also loves to draw bears on coffee, so if you’re lucky, she’ll do one for you! There’s also a Pay-It-Forward scheme here, which allows you to pay $12 and provide someone else less-fortunate with a hearty meal. Well, Christmas is just a blink away and it’s the season of giving right? 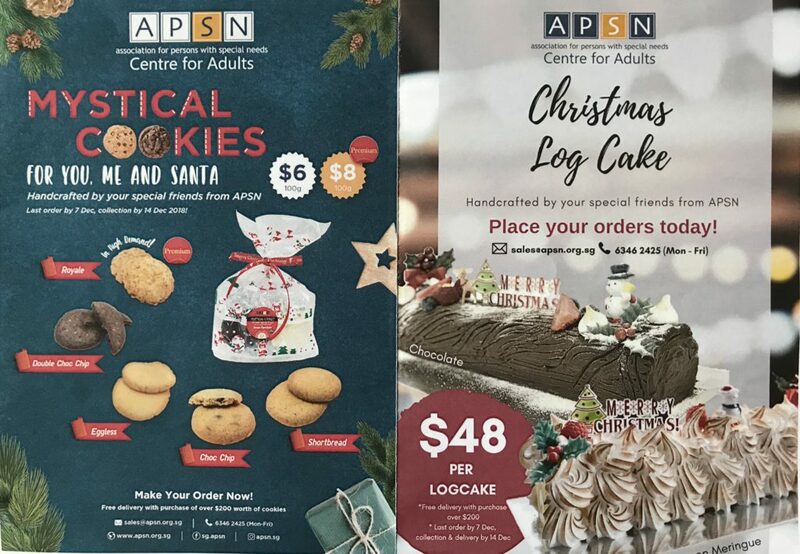 If you’re looking for a yummy cake for early Christmas feasts or cookies to gift your loved ones, your friends at APSN have got you covered. Place an order for a Chocolate Logcake or Lemon Meringue Logcake for only $48. Cookies are also going at $6 to $8 per 100g, offering five different flavours – Royale, Double Choc Chip, Eggless, Choc Chip, and Shortbread. They are only accepting orders until 7 December, collection by 14 December, so hurry if you’ve got your eye on these sweet treats. Proceeds from the sales are channelled back to support APSN’s programmes and pay the trainees an allowance. I will admit to feeling a little trepidation on this venture, but I found myself suitably chastened after my hearty meal. 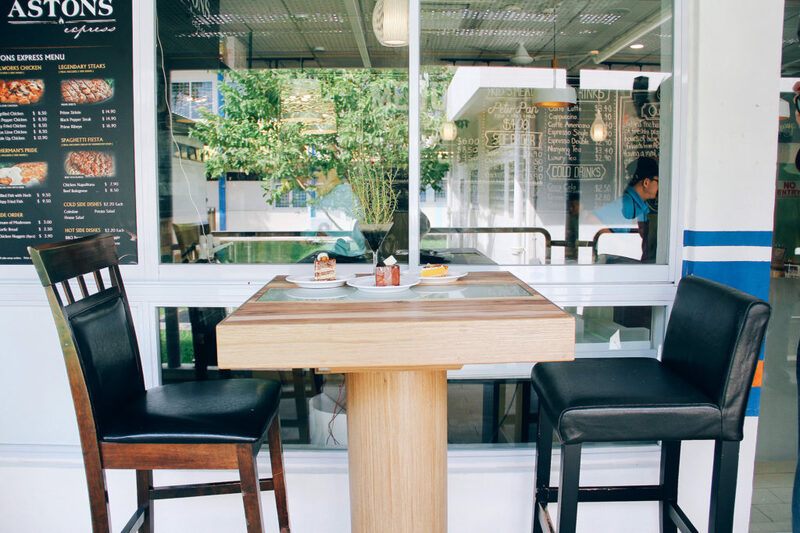 You don’t have to be blessed with gold or have a heart of gold to pay this cafe a visit. The quality of food here is in no way inferior to other cafes and don’t even get me started on how affordable their prices are. This is a tasting hosted by APSN but opinions are entirely ours.